Having long hair I can really get caught up in just putting my hair on top of my head and calling it a day and being too lazy to ever do anything fun with it. I met the ladies of FranceLuxe.com back at Lucky FABB in April and loved how adorable all their hair accessories were and actually got excited about doing something new to my hair again. They have so many gorgeous and unique hair accessories, one could make a new look for an entire year practically! 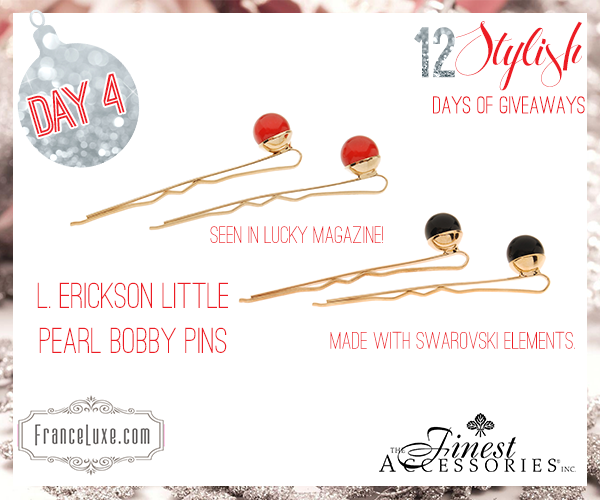 I was so excited to hear that they want to give one lucky Stylelista Confessions reader a chance to win 2 sets of L. Erickson Little Pearl Bobby Pins that are made with Swarovski elements! Definitely check out their website for tons of holiday must have hair accessories! So lets get to the giveaway! Remember to enter below using Rafflecopter and check back through December 16th for new giveaways! Check back here on Monday 12/8 to see if you're the winner of this giveaway! Good luck!